Ever since I saw Rosemary in hers, I've kinda been hankering after a pair of galaxy leggings. I just really like the print and the moody purple and blue colour palette, scattered through with little bursts of planets and stars. Dreamy. But I'm not really a leggings type of girl and deep down I knew if I picked up a pair, they'd languish unloved and unworn at the back of my wardrobe. Enter Romwe, a site I've been eyeing for a while, having seen fellow Irish bloggers like Leanne Woodfull rocking some of their pieces in style. The site is operated from China and offers affordable, trend-led fashion pieces with free worldwide shipping - not bad, huh? 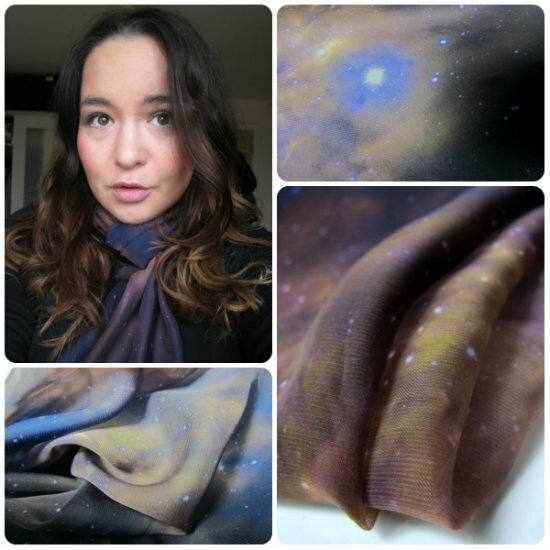 I ordered this galaxy print scarf and a detachable collar, which unfortunately sits too high to be worn with anything I currently own. The scarf though? I love. It's silky smooth and I find the print just mesmerising. If you're braver than me they also seem to do this print on just about anything - dresses, skirts, leggings, even a coat! My order arrived within two weeks and the scarf was a very reasonable €12.89. Have you purchased from Romwe before? And where do you buy online? Moody purple is the right term to go with it! I think it goes great with your lighter skin tone and it makes your eyes pop! This is gorgeous on you and would you look at that pout! twit twoo! That pout is a family trait Karen - we can't help but make that face when we look in the mirror, I don't know why! That scarf is so pretty! love it! I haven't purchased from there yet but I get their emails all the time! I love that print too and it looks lovely on you! The scarf looks great on you! I love the print of your scarf Emma, I think you know how obsessed with scarves I am! I find myself shopping online more and more. I've been getting a lot of accessories on ASOS which I love because they do free shipping, I also love Etsy for more unusual or vintage stuff that you can't find anywhere else. I do still have to try on clothes before I buy them though! Oh wow, thats is all kinds of beautiful!